Up at 3:30 am, I caught a 6:20 am Southwest flight from Sacramento to Phoenix. Boarding with A33, I was able to load from the rear of the plane and get one of the nice exit row seats on a newer 737. With a very short layover, I caught a 9:50 am Southwest flight from Phoenix to Kansas City. With A26, I got another exit row on an older 737. I was on the ground in Kansas City about 1:30 pm. I took an Uber to downtown Kansas City. I spending two nights at the Kansas City Downtown Marriott. After checking in, with Sharon's urging, I took another Uber to the Nelson-Atkins Museum of Art. I spent about two hours wandering through the museum. The museum exceed my expectations. 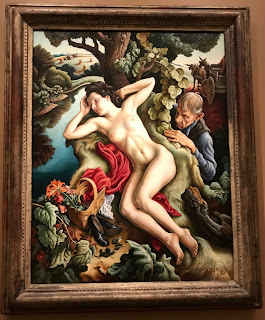 The collection includes a Caravaggio [John the Baptist], an Hieronymus Bosch, several Van Goghs and the largest public collection of Thomas Hart Benton. For years, Sharon had a Thomas Hart Benton poster hanging in the East View and Marina Point houses. There were two special exhibitions: Through the Eyes of Picasso and Dreams of Kings: A Jade Suite for Eternity. The Picasso exhibit was very good.